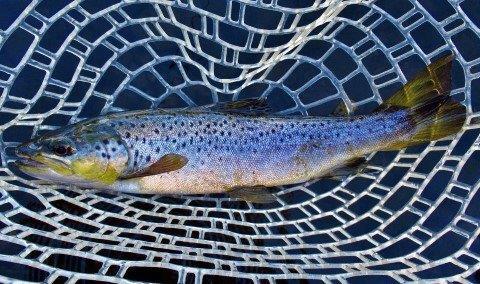 Please check all relevant authorities before fishing - www.ifs.tas.gov.au and dpipwe.tas.gov.au . Don't forget issuu.com/stevenspublishing for years of back issues ! Today I decided I would head on over to the Leven River seeing as I haven't given a thought to fishing it all season for one reason or another. Last season I only had the one trip here and that was early February 2017 after we had 20 mms of rain, that day I caught & released 10 browns and 1 rainbow. Since we had some good rains a week or so ago I checked the river levels and it had a reasonable flow of water in it so I felt it's worth a shot. I'm well over due for a good bag of fish so I was hoping this may be the day as I new exactly the stretch of river I'll be fishing too. It's fished well before for me and I'm reasonably confident it will do so today. 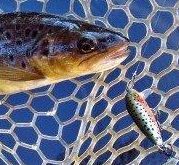 The hardest thing will be the choice of lure to use, the gold & copper Aglias & Black Fury spinners have worked well here before, so have the f3 Rapala rainbow & brown trout hard body lures. In the 90s, Rex Hunt made kissing a fish before you released it back into the waves a thing. 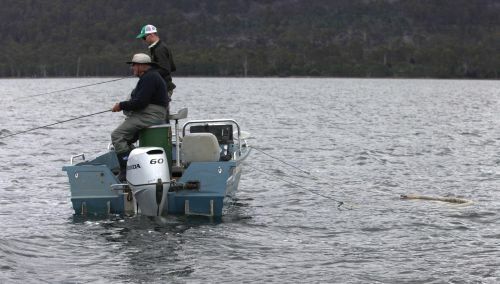 But that is exactly what researchers are asking Tasmania's recreational tuna fishers not to do. The new Tuna Champions program will share the latest research with recreational fishers on how to handle tuna, whether that is to make it taste it better on the plate or to increase its chances of survival in a catch and release situation. Another beautiful day was forecast so I headed over to the Meander River again today for a spin session in the hope of catching a few more trout. I forgot to check the river level on the BOM site before I left and after a drive through heavy fog I finally arrived at the Meander only to find it was running at the same height as my last trip here. Right away I knew I was in for a tough few hours in the river with so much water coming down. I decided to drive to another area that meant for a long walk to the river, but I didn't have to cross it, I could fish it from the side that I entered the river. 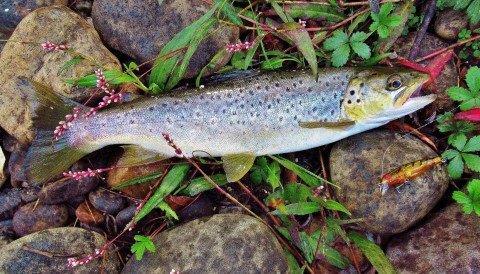 There are a couple of deep stretches of water that I can bypass quite easily, the rest of it is mainly fast water with a few medium runs thrown in the mix... After a forty minute walk I reached my entry point and started casting the Rapala brown trout lure around without all that much success over the first couple of hundred meters. Another beautiful day had me heading over to the Meander River for a spin session, one that didn't last all that long. Why it didn't last all that long was when I arrived there I found the water level was pretty high and the area I was to fish wasn't looking all that safe for wading. Seeing how well I know the river here I still thought it may be worth having a go to see if I could still catch a trout or two. The hardest part was crossing the above waist deep water, a couple of times I thought of turning back but knowing it was only going to get shallower I kept going.. Where I crossed wasn't really fast water but it was deep and had quite a bit of force in the flow and that was my main concern at the time... Once I had reached the other side and using a brown trout F3 Rapala I slowly fished my way upstream. Well after a weeks lay off from fishing due to some good rain and gale force winds (plus hip & back problems) it was time to head back to try the tannin waters again. I was hoping the small tannin waters that I'm heading to will still have some good flow to it as well as holding a few trout. Once there I found it to be a little on the low side and wasn't sure if it was worth having a spin session in it or not. Seeing as I had driven all the way to this little tannin water I thought I may as well give it a go so in I hopped and started flicking the little gold Aglia around in water that was so dark I could hardly see the gold blade spinner as I retrieved it. 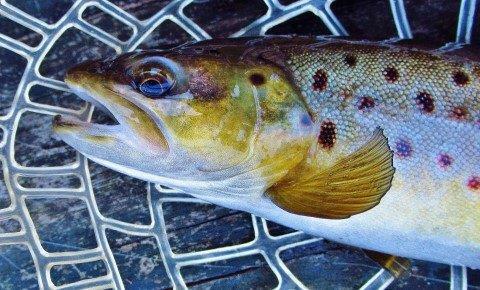 It wasn't all that long before a small 260 gram brown swooped on the lure, I soon had that little fish in hand, released and back in the water. A little further on I had a couple of solid hits on the spinner but missed both fish. 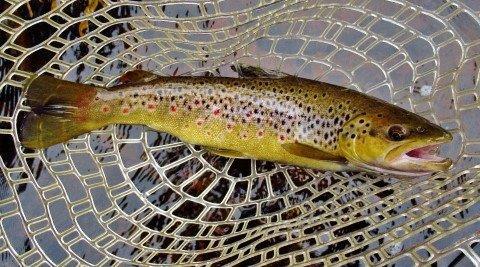 It was time for a change of lure so I went for the F3 Rapala in the brown trout patten. for females in the Western Region. 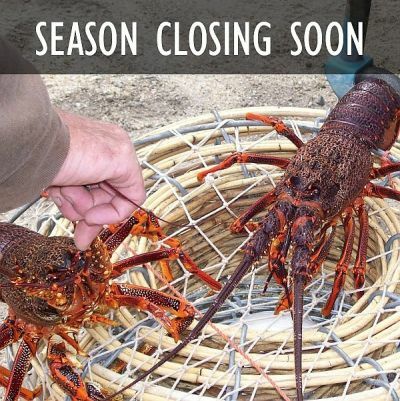 You must have rock lobster pots and rings off the water in the Eastern Region by midnight on Monday 30th April. You cannot transit to or from the Western Region around Whale Head with lobster or gear on board during the Eastern Region closed season. The season for males in the Western Region remains open until 31 August 2018. We headed out of Coles Bay and zoomed through Schouten Passage between the spectacular Hazards peaks and Schouten Island on Tasmania’s East coast. The sun was shining, the breeze was dropping and the twin Yamaha 115s were quietly humming on my 7m trailer boat; ChoonaChasa. We’d entered the Coles Bay Classic run by the Southern Game club and we were heading to the edge of the continental shelf to chase what I believe is the mightiest fish in the ocean; broadbill swordfish, Xiphias gladius! We arrived at our chosen mark around 0900. A quick scan of the ocean floor revealed undulating features holding fish that we predicted as blue eye trevalla, gem fish, blue grenadier, frost fish and more. A nice ‘Scatter Layer’ of fish and probably squid mid-water added to the food chain and we decided the area was prime for a deep drop or two. We quickly finalised our first sword rig; today we had a Penn Power Curve 24kg rod and Penn 50 VSW reel filled with 24kg Platypus mono. Add to that a 300lb JEM wind-on leader to a large swivel clip. On the clip an LP Electralume tri-colour light and then a 400lb leader to a 14/0 offset J hook. On the hook a whole arrow squid fixed in place with waxed thread and covered with a 14 inch yozuri squid skirt with glow eyes. We attached a breakaway sinker with a short length of thin line and over she went down to the depths of over 500m. We then deployed an electric reel with baits for the bottom fish to determine what was lurking down there and soon pulled up a blue grenadier. 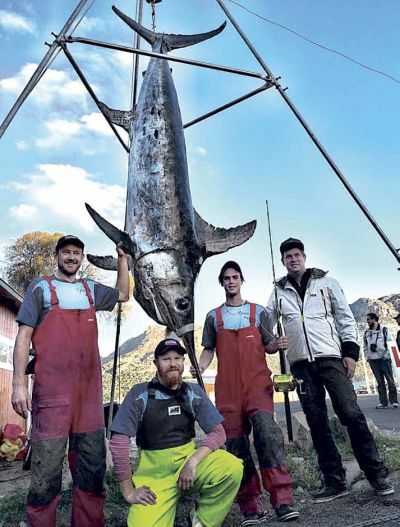 There had been no bites on the swordfish line so we retrieved and moved in-shore somewhat. Met up with good friend Clint for a spin session on the Meander River this morning and I'm hoping to catch the three trout required to reach the 600th trout, a target that I set myself at the start of the 2017/18 trout season. With nice warm weather conditions and the river running some five inches higher than my previous trip to the river we decided to fish from well below the Chestnut Road bridge and work our way back upstream to it. Once there I started off with the bloody tiger prawn coloured Greedy Guts lure and Clint also had a lure of a similar colour with his set up. I told Clint to have a few casts into a large flat water at the tail end of the stretch of river we were starting from, it's always given up a trout or two on my previous trips here. I think it was on his second or third cast when he was onto a nice solid brown that gave him a good start to the spin session. Will I or wont I go fishing, that was what was going on in my head this morning. In the end I did go and headed over to Merseylea for a spin session. It was only going to be a short one as I had several things to do at home that I haven't got around to lately. When I arrive at the river I was surprised not to see any cars parked near the bridge seeing as it was quite a nice morning to be on a river. After a twenty minute walk through a few paddocks and a dried up back water I was at my starting point only to find it wasn't the same here any more. There has been quite a lot of work done along the river and my fast water run I loved to fish was now a wide deep stretch of water. Any way I put on a F3 rainbow Rapala lure and started casting to the opposite river bank while slowly retrieving the lure at the same time letting it go with the flow. 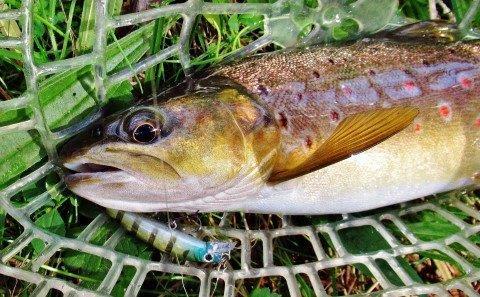 After the forth of fifth cast & retrieve I had a follow from an interested trout that followed the lure right up to where I lifted the lure from the water. That's where it ended, it turned and slowly moved away. Onto the next stretch of water, this one was more to my liking as it hadn't had a lot of work done to it. It had been made a little deeper but two thirds of it was still okay for wading my way up the river. Before I entered this stretch of water I had a change of lure, it was the Daiwa ghost brown lure I went for. After having a doctors appointment this morning I had a pretty late start on the Meander River in what was beautiful fishing conditions and the river level had dropped which made it even better. I received a few new Austackle lures that I picked up for half price from MO-Tackle last week and they arrived this morning so I'm itching to give them a workout. I was in the river by 11:10 am and started off using the ''Wolf '' 50 mm hard body lure which has a narrow body and is practically the same patten as the Daiwa ghost brown one that I use. It took me around fifteen minutes before I had my first follow from a medium size brown and that's as far as it went, just a follow. 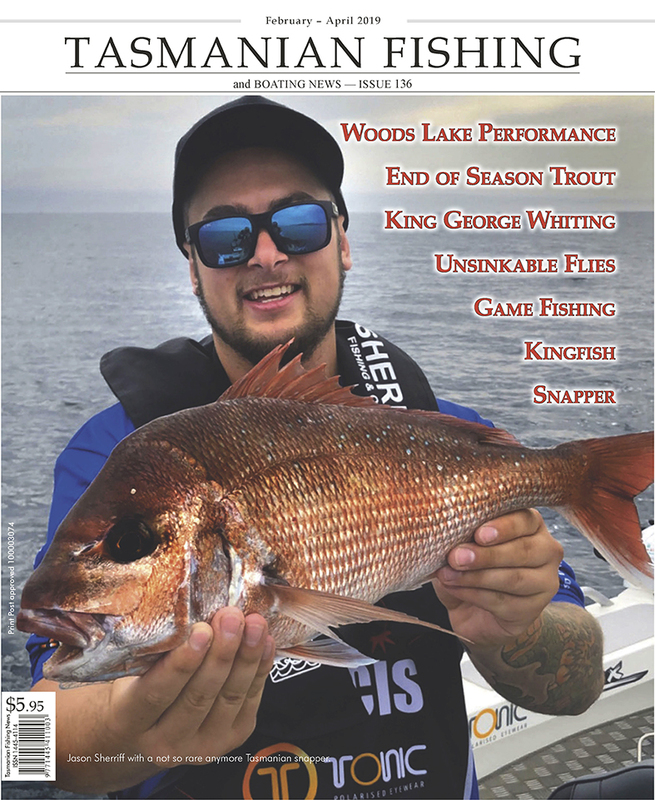 Many anglers are preparing for the opening of the new angling season on Saturday 7 August and it's shaping up to be another good one with the fishery in excellent health as a result of last year’s drought breaking rains. 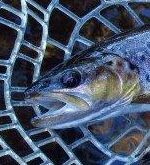 There are many great fishing locations around the State from which to choose for the opening weekend and early season fishing but here are a few suggestions.